The following leads you through the software activation process for an internet-connected machine. If you need to activate your IBExpert software on a machine that is not connected to the internet, please see below: Registering IBExpert on a stand-alone PC. Enter your IBExpert Download Center account email address in the Username field and your IBExpert Download Center account password in the Password field. If you have direct internet access, you then simply need to click the Get Code buttton, and your software registration will be automatically activated. This window confirms the successful activation and also displays the number of remaining software activations (should you have more than one registration running on your account) and the remaining subscription period. After clicking OK, you can view your Unlockcode in the registration window. 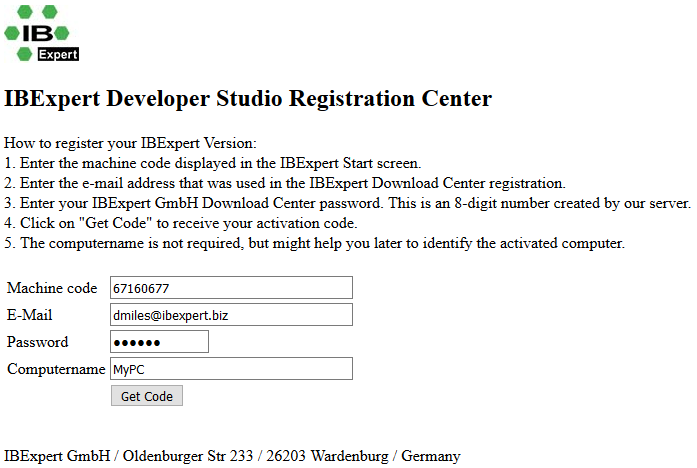 Click OK here, to start your IBExpert software. If you need to install IBExpert on a machine that isn't connected to the internet, you will need to take the following steps. Download the current IBExpert version (setup.exe) on an internet-PC. Copy the setup.exe to the stand-alone PC and install there. 3. Note the machine code (by hand or copy to a text file which you can transfer to the internet-PC or your smartphone). which you can then copy onto your stand-alone PC to start IBExpert.